The last two working sessions were spent building a ‘Bug Hotel’. 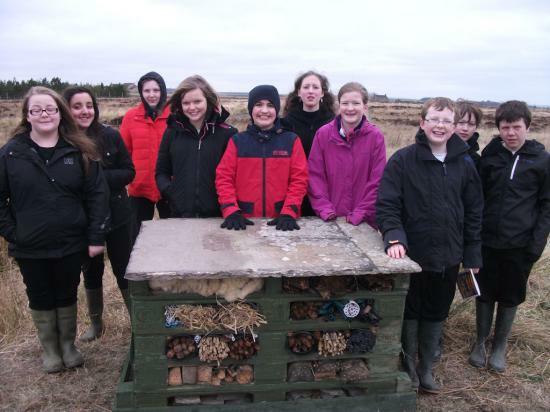 The Bug hotel was constructed from old pallets and stuffed with recycled materials. Natural material such as pine cones, canes, tree bark, twigs, leaves straw, flagstones were used to provide suitable habitat to attract a wide range of mini beasts. Old flower pots and pipes were also used to create nooks and crannies for the little creatures to occupy. Ranger Marina Swanson who has been working with the youngsters said: “The pupils have worked extremely hard and have been very positive in taking on different jobs around the site. 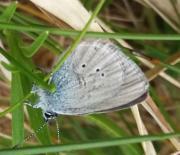 The woodland is in its infancy and so we are lacking some useful habitats for a range of wildlife species. We hope the bug hotel will attract some smaller creatures to the site which in turn will attract other species. Newtonhill Croft Woodland site is owned by Forestry Commission Scotland. The Friends of Newtonhill Woodland are an active community group assisting with site management and are currently working on the renovation of the old cottage on site. Anyone with an interest in joining this community group should contact the secretary by e-mailing bill.ros1[AT]btopenworld.com.